The future Ski Village will transform the existing Levi ski resort into a world class destination, offering top quality accommodation and leisure services for skiers of all levels and demands. The proximity to the Kittilä airport ensures easy access to the resort attracting international visitors to Levi village and the whole Lapland region. The Finland-based developer Kassiopeia Finland Oy is investing in its local region as it currently owns and operates Hotel Levi Panorama, Levi Summit Congress Center and Hotel K5 Levi and above and beyond has interests in developing the exquisite Koutalaki area. “BIG’s visionary approach of combining unique types of accommodation and amenities along with the leisure activities offered at the resort, left the jury in awe. BIG’s ambitious plan challenges traditional thinking and we believe that the collaboration between Kassiopeia Finland and BIG-Bjarke Ingels Group will rise to the occasion.” Jury, Kassiopeia Finland Oy. Located on a gentle slope, the existing Levi ski center provides the framework for the future Koutalaki Ski Village which is conceived as an extension of the summit and the existing cluster of buildings in Koutalaki. BIG proposes to create a series of buildings that radiate out from a central square and whose ends touch the ground to create four freestanding buildings that each provide access to the roof and allow the skiers to descend from the resort’s rooftop downhill in any direction. The soft curves of the undulating roofs of the four buildings create a visual continuity of the natural land¬scape while lending the whole village the unique character of a skislope skyline that creates an inhabited mountain top. ”The Koutalaki Ski Village is conceived as an extension of both the summit and the resort. Grown from the natural topography rather than dropped from the sky – the ar¬chitecture extends the organic forms of natural landscape creating an inhabitable as well as skiable manmade mountain. 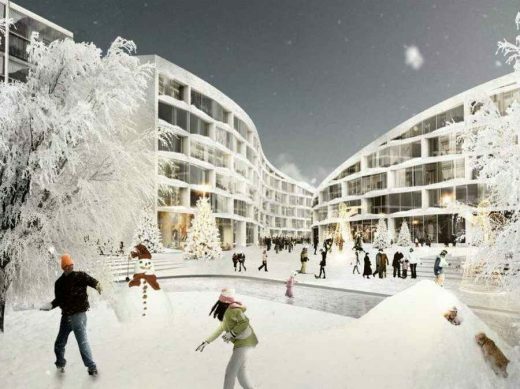 As a result, our design for the Koutalaki Ski Village creates a new hybrid integrating distinct identities such as village and resort, shelter and openness, cozy intimacy and natural maj¬esty, unique character and careful continuity – or simply – architecture and landscape.” Bjarke Ingels, Founder & Partner, BIG. The four build¬ings arc around a central square to create a new bustling village plaza at the heart of the resort, which is sheltered from the wind yet open and inviting to the surrounding landscape. The plaza allows ice skating and music events and is connected to a bowl like yard with cafés and bars created by the lower interior heights of the new buildings. The intimate atmosphere of the spaces created here contrasts the open views from the summit. The whole resort area is connected through a network of paths that prioritizes skiers and pedestrians. Access to the roofs happens through central elevator cores allowing skiing down either towards the courtyard or the piste. An elevator located centrally in the hotel provides access to the roof top restaurant with a 360 degree panorama views of the landscape and plaza. ”When first visiting the future Koutalaki village site you realize the proximity to the ski slopes but at the same time the importance of creating a connection for skiers as well. The gentle slope away from the main ski system seems to offer the solution for a unified proposal that creates maximum connectivity for skiers and pedestrians.” Jakob Lange, Partner-in-Charge, BIG. All accommodation units offered at the new resort enjoy beautiful views of the surrounding nature, including the eight private villas which are situated at different elevations to provide an undisturbed panorama, while the elevated private gardens serve as an extension of the landscape. The villas embrace the snowy landscape and allow the snow in all its forms become a part of the architecture itself. “Instead of creating design solutions that aim at dealing with snow by shoveling or moving it, we want to create a village that utilizes the full potential of snow. When it is caught on the façade the window frames become a living part of the landscape, adapting to changes in the weather. The light granite façade enhances the intimate relation with the nature. “ Hanna Johansson, Project Leader, BIG. While the four buildings simulate real ski slopes during winter time, combining the essence of a ski resort – skiing, relaxation, rec¬reation and dwelling, the roofscape of the buildings during summer will be just as attractive serving as a green continuum of the surrounding natural landscape for hiking and pic¬nics. BIG (DK) + Pirmin Jung Engineers for Wood Constructions (CH) + AOA Anttinen Oiva Architects Ltd (FI) + Vahanen Engineers (FI) + Stora Enso (FI) is the winning team to design a prototype wooden construction system for a pilot project in Kouvola, Finland that will serve as a showcase for the sustainable use of timber construction worldwide.